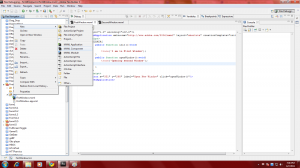 In this example I will show you how to open a new window from an adobe AIR Application. First you create a new Flex Project and named FirstWindow. Now you have FirstWindow.mxml in your project. Go on open it and copy the following code to it. Now right click on the src folder and create an MXML component. select Window from the Dropdown and name it SecondWindow. Now copy this code to it. It’s all done. Now run it.